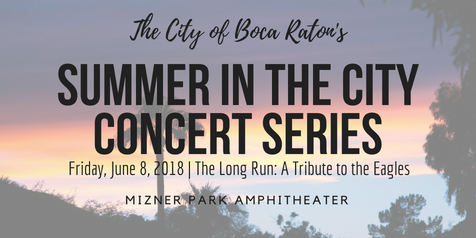 On Friday, June 8, 2018, The City of Boca Raton will kick off its “Summer in the City” tribute concert series at Mizner Park Amphitheater in Downtown Boca Raton, with a free concert featuring The Long Run: A Tribute to the Eagles. Doors to the event will open at 7:00 pm, with the show beginning at 8:00 pm and running until 11:00 pm. The Summer in the City Concert Series, sponsored by the City of Boca Raton & Downtown Boca Raton, promises an exciting line up of FREE tribute concerts which will run from June 8th through August 11th at Mizner Park Amphitheater. Some of the other amazing concerts in the series will include tributes to some of music's greatest icons, including The Beatles, Elton John, Billy Joel, and Prince, among others. In addition to the live musical performances by some of the most popular local tribute artists, each event will also feature a combination of food, drinks, fun, and games. Each of the events planned for the Summer In The City series is absolutely free and open to the public with doors opening an hour before the show, rain or shine. Attendees are free to bring their own chairs and blankets for seating, however, chairs will also be available to rent for $5.00. All attendees are strongly encouraged to walk, bike, carpool, or use the free parking available at City Hall and the Downtown Library, as parking at Mizer Park is limited. The Summer in the City Concert Series at Mizner Park Amphitheater is sure to be a fantastic time for music fanatics as well as a fun & rewarding experience for the entire family. We look forward to seeing you there! For more information about the Summer In The City Concert Series please visit the City of Boca Raton's Event site. Click here to view the entire line up of free music & game nights planned for the Summer In The City concert series at Mizner Park Amphitheater. For more details regarding the event venue and answers to frequently asked questions, please visit Mizner Park Amphitheater's FAQs page.